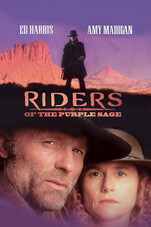 This is the fifth and most recent film version of Zane Grey’s 1912 bestselling novel, which is perhaps as some call it “the most popular western novel of all time.” Having said that, it should also be noted that this, as some other oft-retold western stories dating from near the turn of the 19th century, does not wear its age lightly. The film’s strengths: very good cast, attempt to be true to the language of the novel, beautiful locations (Moab, Utah). Weaknesses: poor direction and editing, failure to use the scenery well. This is a Shane story, from before Shane—the Mysterious Stranger. An unknown gunman rides alone into a tense situation and turns things around by siding with the underdogs. In this case, the underdog is Jane Withersteen (Amy Madigan), spinster-rancher in a religious community in southern Utah (presumably, by the looks of the terrain). Without much help, she is facing (a) rustlers, (b) Deacon Tull (Norbert Weisser) of her own church, who wants her to marry him and is trying to force her hand, and (c) Pastor Dyer (G.D. Spradlin), who also wants her to marry Tull. When Tull and his men are attempting to hang Bern Venters (Henry Thomas), one of her hands, she prays for help, and into this mess rides Lassiter (Ed Harris, balding with otherwise long hair), who backs them off and they ride away without completing the hanging. Lassiter (Ed Harris) and Jane Withersteen (Amy Madigan). Lassiter, who spends most of the film without a first name, tells Jane he is looking for the grave of Millie Erne and wants to know how she came there. Jane seems to have harbored friendly feelings for the late Millie and is willing to show him the grave, but does not give him any of the other information he seeks. He agrees to stay and work for her until she does tell him. Meanwhile, Bern rides out looking for rustled cattle and finds Oldring’s rustlers, including a strange masked rider. When they come after him, he shoots them. 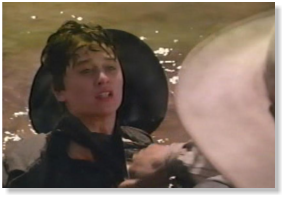 The masked rider turns out to be Bess (Robin Tunney), a female. Bern hides her in an Indian cave dwelling and nurses her back to health. Back at the ranch, Pastor Dyer shows up to lecture Jane and pulls a gun on Lassiter, who wounds him. Jane’s one remaining hand, Judkins, is killed and her two best riding horses (Black Star and Night) are stolen. Bern crosses paths with the thieves, recognizes Jane’s horses, and exchanges shots with them. 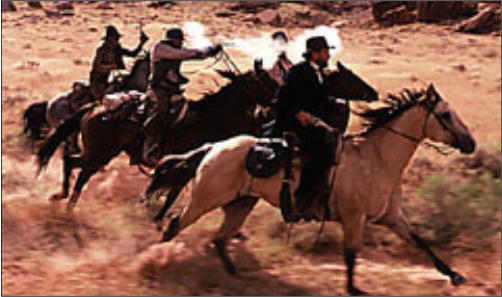 He gets several of them, including Oldring, but is captured by Tull, who is riding with the rustlers and takes Bern off to be hung (again) for stealing the horses and killing Judkins, which he obviously did not do. At this point, Jane tells Lassiter that Pastor Dyer was the one who stole Millie Erne from her husband and family and gave her to Jane’s own father. When her father tried to force Millie, she shot him and then herself. Meanwhile, her father had given away Millie’s infant daughter. Lassiter straps on his guns and heads to the church, where he blasts all the bad guys except Tull, including Dyer. Taking Black Star and Night, Lassiter and Bern pick up Jane and head for the cave where Bess is waiting. It develops that Bern and Bess are in love, that Bess is in fact Millie’s missing baby (although she thought she was Oldring’s daughter), and that Lassiter is Millie’s brother and has been following her trail for thirteen years. The masked rider is (gasp!) a girl! It’s Bess (Robin Tunney). They see Tull and his riders heading for them, and Bern and Bess take off on Black Star and Night, leading the pursuit away and heading for a new future together. Lassiter and Jane have only one horse for the two of them and head up the canyon to where Bern was hiding Bess. As Tull eventually realizes his mistake in being led away and returns to follow Lassiter and Jane, they tip over a huge rock and cause a landslide on to him. And presumably they live happily ever after. As with Conan Doyle’s “A Study in Scarlet,” the 1912 Zane Grey novel makes Jane’s religious group specifically Mormons, following cultural conventions current when the book was written, what with Mormon reclusiveness, their practice of polygamy and supposed related woman-stealing. This film makes the bad guys a non-specific religious cult, now that Mormons are more mainstream. The action takes place in 1871, so Lassiter has been following the evildoers since before the Civil War, apparently. This is only about 90 minutes long without commercials, and it does not flow well. The Oldring thread of the story is not very developed. The direction (by Charles Haid, once an actor on television’s Hill Street Blues in the early 1980s) seems like television direction, not using the spectacular canyon landscapes as well as it might. The red rock shots seem like postcards, not related well to the surrounding terrain or to the story. John Ford would have done it better; even Gore Verbinski did it better (in the otherwise forgettable The Lone Ranger), but they both probably had much bigger budgets. There is good use of light and dark, which gives an appropriate 19th-century feeling and perhaps an occasional sense of the moral confusion Jane Withersteen is feeling. Deacon Tull and his henchmen, in hot pursuit of Lassiter and Jane. All in all, not great but worth watching—perhaps the best version on film of this antique story. The previous most recent film version was made almost 60 years before this, in 1941. This and several other often-retold western stories from its era (The Virginian, Whispering Smith) can seem kind of clunky and dated to modern viewers. This story has a great title–good enough to be adopted by a country-rock group in the late 1960s and by three separate country-western groups. But it’s unclear what riders are referred to in this story. 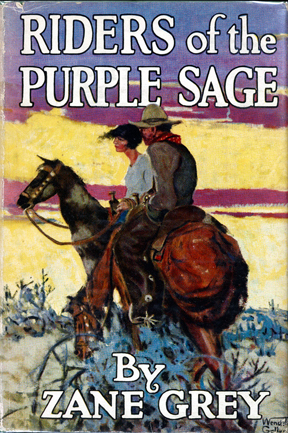 Everybody rides the purple sage: rustlers, religious zealots, ranchers, spunky spinsters and mysterious gunmen. Zane Grey is not read nearly so much as he was a hundred years ago, and his cultural assumptions and floridly romantic sensibility have not worn well. His writing style is not much to modern tastes, either. But he still tells a good story if one takes the trouble to read him. 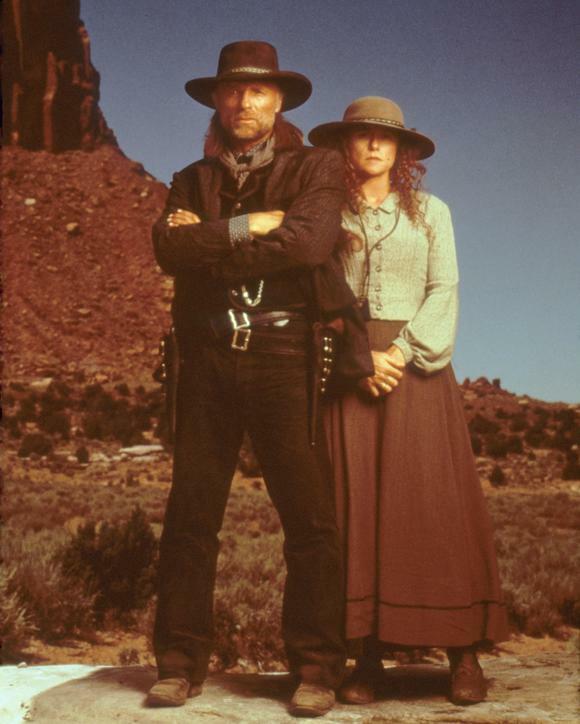 Ed Harris and Amy Madigan, the leads, were married when this was made, and they were also executive producers. All four of the leads here give good performances, and it’s a shame the film doesn’t have a good flow to make better use of them. Apparently Ed Harris liked westerns enough after this experience to direct and star in his own several years later: Appaloosa in 2008. This was made for television’s TNT network which, in the late 1990s and early 2000s was one of the best places to see new westerns and remakes of old western stories, often with Tom Selleck or Sam Elliot. Another classic western story from this period of TNT’s sponsorship is the 2000 version of The Virginian, directed by Bill Pullman and starring Pullman and Diane Lane. This entry was posted in Westerns Worth Watching and tagged Ed Harris, Gunman and Religion, Made for Television, The Mysterious Stranger on January 13, 2014 by Nicholas Chennault.